The U.S. NTSB issued seven safety recommendations, aimed at providing long term solutions for reducing the risk of MD-11 landing accidents. The McDonnell Douglas MD-11 airplane was involved in fourteen hard landing accidents since 1994, leading to several safety recommendations. The last recommendations were issued on July 12, 2011, while two accident investigations were still underway. These recommendations addressed the need for improved recurrent training and operational guidance for MD-11 pilots. 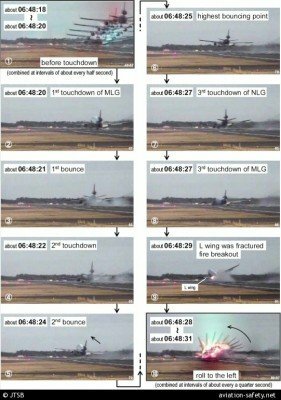 The NTSB believed that the actions described in those recommendations would provide near-term improvements to reduce the risk of MD-11 landing accidents. The seven new recommendations are aimed at providing longer term solutions for further reducing the risk of MD-11 landing accidents. the airplane’s use for long-range cargo flights, which reduces the opportunities for pilots to maintain landing proficiency compared with transport-category pilots who do not fly such routes. The interaction of all of these factors might increase the MD-11’s susceptibility to a late flare, a bounced landing, and improper column inputs by the pilot after a bounce, which could lead to overload of the main gear and the potential for catastrophic structural overload, a hull loss, and injuries and/or fatalities, according to the NTSB.